Physicist Eric Betzig, a group leader at the Howard Hughes Medical Institute's Janelia Research Campus, and colleagues report the work April 19, 2018, in the journal Science. Scientists have imaged living cells with microscopes for hundreds of years, but the sharpest views have come from cells isolated on glass slides. The large groups of cells inside whole organisms scramble light like a bagful of marbles, Betzig says. "This raises the nagging doubt that we are not seeing cells in their native state, happily ensconced in the organism in which they evolved." 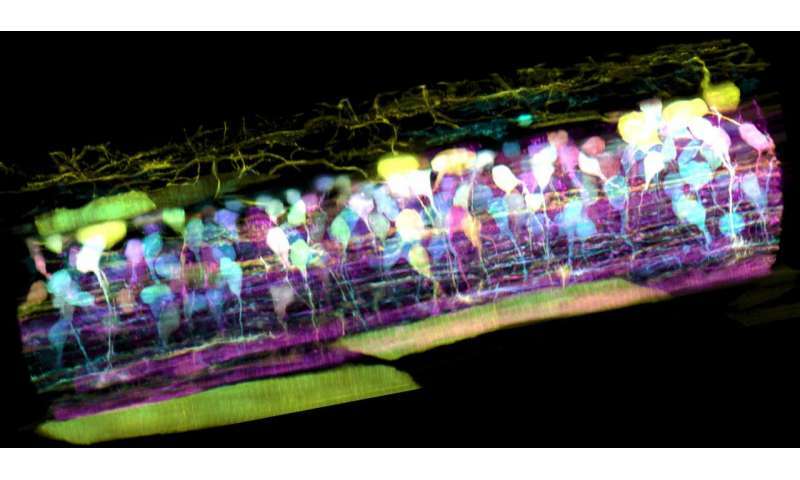 Even when viewing cells individually, the microscopes most commonly used to study cellular inner workings are usually too slow to follow the action in 3-D. These microscopes bathe cells with light thousands to millions of times more intense than the desert sun, Betzig says. "This also contributes to our fear that we are not seeing cells in their natural, unstressed form. "It's often said that seeing is believing, but when it comes to cell biology, I think the more appropriate question is, 'When can we believe what we see?'" he adds. To meet these challenges, Betzig and his team combined two microscopy technologies they first reported in 2014, the same year he shared the Nobel Prize in Chemistry. To unscramble the light from cells buried within organisms, the researchers turned to adaptive optics - the same technology used by astronomers to provide clear views of distant celestial objects through Earth's turbulent atmosphere. Then, to image the internal choreography of these cells quickly yet gently in 3-D, the team used lattice light sheet microscopy. That technology rapidly and repeatedly sweeps an ultra-thin sheet of light through the cell while acquiring a series of 2-D images, building a high-resolution 3-D movie of subcellular dynamics. The new microscope is essentially three microscopes in one: an adaptive optical system to maintain the thin illumination of a lattice light sheet as it penetrates within an organism, and another adaptive optical system to create distortion-free images when looking down on the illuminated plane from above. By shining a laser through either pathway, the researchers create a bright point of light within the region they wish to image. The distortions in the image of this "guide star" tell the team the nature of the optical aberrations along either pathway. The researchers can correct these distortions by applying equal but opposite distortions to a pixelated light modulator on the excitation side, and a deformable mirror on detection. Over large volumes, the distortions change as the light traverses different tissues. In this case, the team assembles large 3-D images from a series of subvolumes, each with its own independent excitation and detection corrections. The results offer an electrifying new look at biology, and reveal a bustling metropolis in action at the subcellular level. In one movie from the microscope, a fiery orange immune cell wriggles madly through a zebrafish's ear while scooping up blue sugar particles along the way. In another, a cancer cell trails sticky appendages as it rolls through a blood vessel and attempts to gain purchase on the vessel wall. All this detail is hard to see without adaptive optics, Betzig says. "It's just too damn fuzzy." 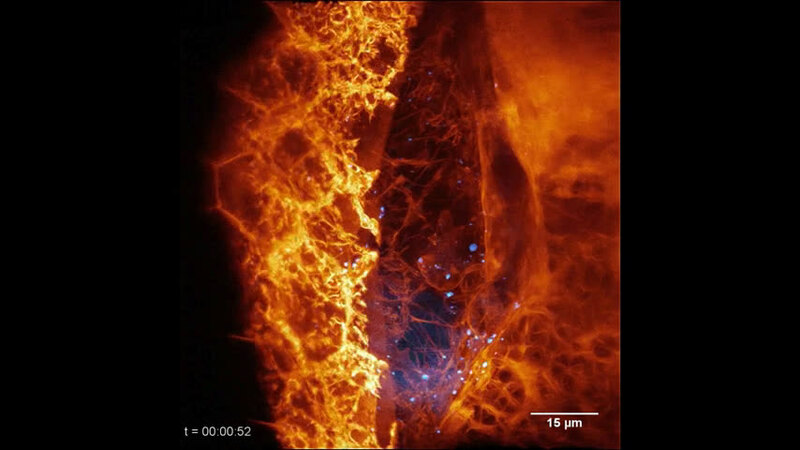 In his view, adaptive optics is one of the most important areas in microscopy research today, and the lattice light sheet microscope, which excels at 3-D live imaging, is the perfect platform to showcase its power. Adaptive optics hasn't really taken off yet, he says, because the technology has been complicated, expensive, and until now, not clearly worth the effort. But within 10 years, Betzig predicts, biologists everywhere will be on board. The next big step is making that technology affordable and user friendly. "Technical demonstrations and publications don't amount to a hill of beans. The only metric by which a microscope should be judged is how many people use it, and the significance of what they discover with it," Betzig says. The current microscope fills a 10-foot-long table. "It's a bit of a Frankenstein's monster right now," says Betzig, who is moving to the University of California, Berkeley, in the fall. His team is working on a next-generation version that should fit on a small desk at a cost within the reach of individual labs. The first such instrument will go to Janelia's Advanced Imaging Center, where scientists from around the world can apply to use it. Plans to create their own copies will also be made freely available. Ultimately, Betzig hopes that the adaptive optical version of the lattice microscope will be commercialized, as was the base lattice instrument before it. That could bring adaptive optics into the mainstream.